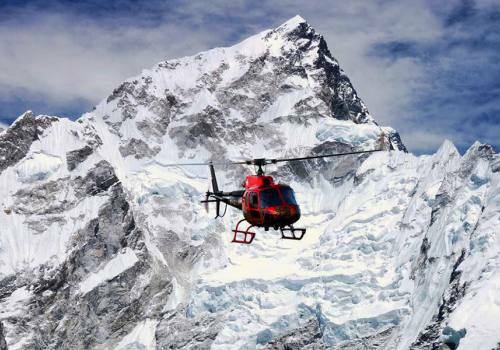 Everest and Gokyo Trek begins by taking an early flight to the Lukla from Kathmandu. From Lukla, we will have a gorgeous day of trekking to Phakding. Then, from Phakding we will carry on towards the north to the gorge of Dudh Koshi, arriving in Namche Bazaar. In the past, Namche Bazaar was just a tiny village, but nowadays, it is a bustling hub for trading and tourism. Many people, especially from Tibet, come to Namche to sell their merchandise. So, it's always nice to stay an extra day to acclimatize to the altitude, and buy some souvenirs to take back home. Next day you will move from Namche Bazaar to Imja Khola to view the fabulous Khumbu Himal, Kantega, Thamserku and Ama Dablam which are situated in the distance, while governing the foreground are Lhotse and Mt. Everest. Visitors can stay at Thyangboche, which is well-known for its Buddhist monastery. 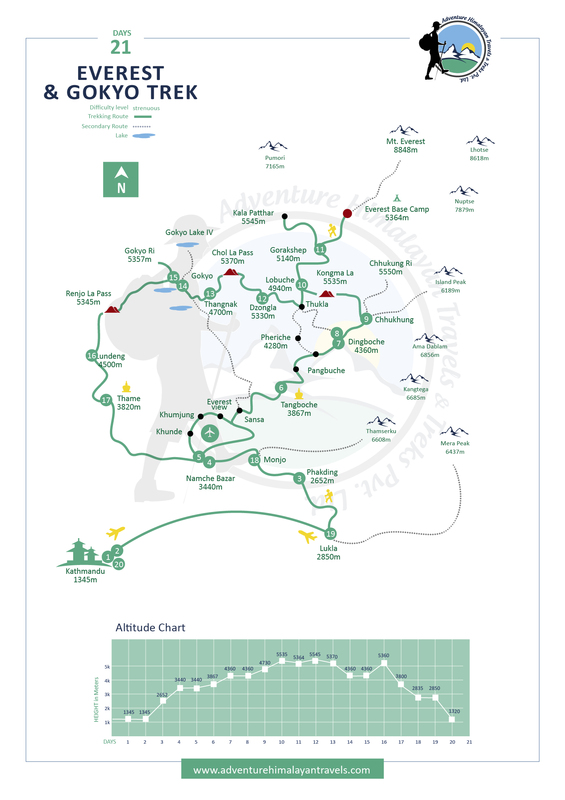 The route climbs up regularly to Imja Khola, finally up and coming over the Dingboche. Dingboche is another beautiful spot to spend an acclimatization day. Again from Dingboche it leads to Kalapatthar through the lateral moraine of the glacier of Everest, Lhotse and Nuptse. The places of interest in Everest and Gokyo Trek are Tyanboche, Kalapatthar, sunset views at Everest Base Camp, Nuptse and Lhotse along with many other places. Even the thrilling flight from Kathmandu to Lukla offers incredible views. The best seasons for the treks are March, April, May, September, October, November and December. However, July and August are supposed to be the good from hiking perspective but sometimes the mountains are not so clearly visible due to rain. It is a moderate trek and you can use tea house for the accommodation. 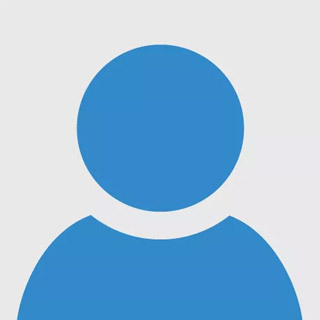 The maximum altitude is 5545km. Tea House is used as an accommodation and minimum group size is only 2. Day 01Arrival in Tribhuvan International Airport, Kathmandu (1320m) Our representative will meet you at the Tribhuwan International Airport, Kathmandu and you will be transferred by private coach to the hotel. In the hotel we will discuss with the necessary equipment and the trekking permit. Overnight stay at a hotel. Day 02Sightseeing in kathmanduKathmandu Valley includes several UNESCO World Heritage Sites, including Pashupatinath, Buddhist stupa in Boudhanath. We can also visit Swyambhunath, also known as Monkey Temple, built in 2000 years old. Finally, we can visit Patan, city of fine arts. In the afternoon, you will be meeting with your trekking guide and will check all the necessary things. Overnight stay at the hotel. Day 03Flight to Lukla (2652m), trek to Phakding (2652m) After a 40 minute scenic flight from Kathmandu to Lukla, you will trek to Phakding. Everest Base Camp trip begins at Lukla and follow Phakding, which takes approximately 3 – 4 hours. Along the way you can have a view of Mt Nupla (5885m) and Kusum Kangaru (6367m). Overnight in Phakding (2652 m). Day 04Trek to Namche (3,440m) 5-6 hrs Starting from a slight rise to Jorsalle, the trail passes waterfalls and other cultural and natural attractions. During the day, you will be passing through the Sherpa villages viewing magnificent forests. Rhododendron trees, magnolias and giant firs provide a stunning backdrop to this part of the walk. En route you will be rewarded with their first glimpse of Kusum Kangru (6369m) Thamserku (6608m) Everest (8,848 m) and Nuptse (7879 m). (Weather permitting) a steep climb up the beautiful village of Namche Bazaar (3440m) which will produce more spectacular views and a comfortable place to spend the second night of the trek. Overnight stay at a guesthouse. Day 05Acclimatization day in Namche Bazaar (3,440m) Acclimatization is important before proceeding to a higher elevation. 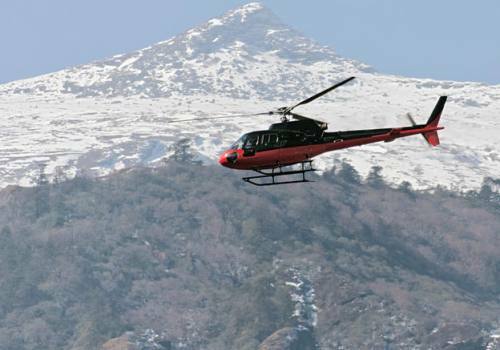 It is therefore recommended that you should take a short day's hike to Thame, Khunde, Khumjung or up to the Everest View Hotel so that we can see a clear view of Mount Everest. You can even relax and explore the culture of Sherpa in Namche. Overnight stay at a guesthouse. Day 07Trek to Dingboche (4260m) 5hrs In the morning we'll have spectacular views of the mountains and the monastery in Tengboche. We will spend most of the morning in the Imjatse Khola through the birches, conifers and Rhododendrons. By following the river to the north, the path goes through several walls chortens and prayer flags around the small villages. On the way you can have the best view of Ama Dablam. After arriving in Dingboche, you can enjoy the beautiful array of fields surrounded by stone walls aiming to protect Barley, Buckwheat, Potatoes. The view of Island Peak is beautiful from Dingboche. Overnight stay at a guesthouse. Day 09Trek to Chukum 2-3 hrs On the 9th day we will trek to Chukum from Dingboche, taking 2 to 3 hours. Though you are walking just 2 to 3 hours that hiking will be the most memorable moments of your life. Further we will hike around the Chukum Valley. As soon as we arrive at Chukum, we must be ready to pass Kongma La. Overnight stay at a guesthouse. Day 10Trek to Kongma La Passes- Lobuche 10 hrs We start our trekking quite early morning today as we will have quite long and tiring day, we head directly west out of Chukhung on a small, rocky trail and contour around many hillsides, usually not very steep, until we reach the Pokalden Base Camp. After a few other hills, we will reach another Base Camp for Pokalden and a clear blue lake which sits just below the pass. We climb the last half an hour on a trail which is good but looks impossibly built into the cliff-side and had to the Lobuche. Overnight at Guesthouse. Day 11Trek to Everest Base Camp via Gorakshep 6-7 hrs We start our trekking following the rocky moraine path, viewing icy glacial pond and icebergs down below Khumbu Glacier. After the last rocky moraine dunes, a short downhill walk brings you to Gorakshep, where we will stop for lunch and we leave all our stuff there at lodge as this is the last place where there are lodge available – then we start our Himalayan journey to the Everest Base camp- WOW !!! Congratulations!!! Your Dream come true now, after taking some snaps and soaking in the views, we return to Gorekshep. Overnight at Guesthouse. Day 12Trek to Kalapatthar (5545m) and to Dzongla 5 hrs Early morning we will climb the Kala Patthar (5545m.) and enjoy the view of sunrise in the Himalayas with views of Everest. 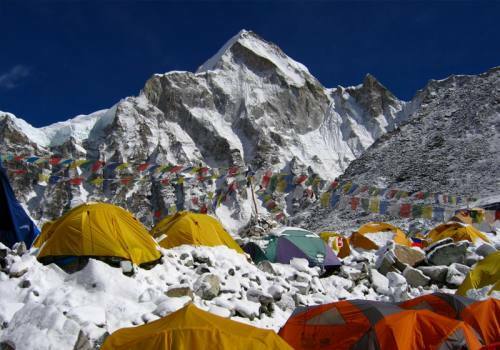 From Kala Patthar we will have a panoramic view of Mt. Everest and many other mountain peaks like Mt. Pumori, Mt. Lingtren, Mt. Khumbetse, Mt. Nuptse, Mt. Lhotse, Mt. Ama Dablam, Mt. Thamserku and many more then we return to Kalapattar, have a Hot Breakfast and continue our trekking to Dzongla. Overnight at Guesthouse. Day 13Back to Thangnak 9 hrs Today, we will start our trekking early in morning, as we are going cross the Cho La pass (5370m), a steep and somewhat difficult ascent of a rocky ridge a few hours walk from Dzongla . We start by crossing a small glacial stream, and then start climbing up the pass. From the top, we are treated to views of Ama Dablam, Kantaiega, Thamserku, Taboche, Cholatse and Baruntse, and to Nangpai Gosain, Pasang Lhamo, Numbur and on the Gokyo side. Once up on top of the glaciated pass, we trek across the snow, with Lobuche West looming above us, to the summit and send prayers out across the Himalayas. After a snack, it’s a scramble back down the pass. 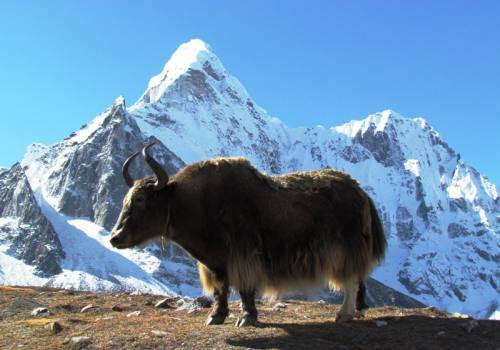 We walk the rocky, hilly trail across the valley, and a descend to the Yak Kharka of Tangnak. Overnight at Guesthouse. Day 14Trek to Gokyo 4 hrs We start our trekking in the morning by crossing the Ngozumpa Glacier on a sandy, shifting trail, the frozen lakes creaking below and beside us as we turn our way to the other side. Once back on the main trail to Gokyo, we have an hour’s hike past the second lake to the lodge at Gokyo. In the Gokyo Valley, the character of the trail changes abruptly. The opaque powder-blue lakes are often on the verge of freezing over, and sometimes perform a Himalayan symphony of expanding and retracting ice. We have entered the grassy valley running beside the Ngozumpa Glacier, and have our first sight of Gokyo, a seasonal village and grazing area built beside the third and biggest lake. Gokyo has become something of a Himalayan resort without the crowd – at least in terms of the comfortable lodges with sunrooms, unbeatable views, excellent food and warm stoves. It is a great base to explore from, and we have plenty of time for it. Overnight at Guesthouse. Day 15Rest day and excursion Gokyo is a trade center where the Sherpa people run lodges to provide the best services to the trekkers. 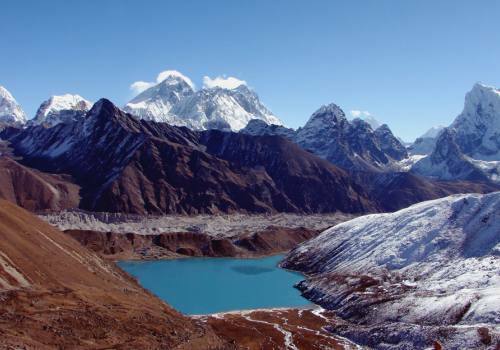 Gokyo is situated by the side of Ngozumpa Glacier, the biggest glacier of Nepal. Today, we will walk around the lake and we can make the side trip of the fifth lake as well if you are fit. Overnight at Guesthouse. Day 16Trek from Gokyo Renjo Pass (5345m), Lunde 7 hrs Early morning after breakfast, we will climb Renjo La pass. This is a really nice high pass in Everest region, gaining popularity these days. In last few years, this area is only possible in Camping/tent basis trek, which is now possible with lodge trek too. Overnight at Guesthouse. Day 17Trek to Thame 4 hrs It is easy trekking down to Thame. Overnight at Guesthouse. Day 18Trek to Monjo 6-7 hrs We continue our trekking following the flat and descending to first resting place Thamo and after we head towards to Monjo. Overnight at Guesthouse. Day 19Trek to Lukla (2886m) 4hrs Today is the last day of your trekking, the trekking is pleasant, except for few short uphill climbs and then down to the Bhote-Koshi River, crossing it three times. The last uphill climb of 45 minutes will bring you to Lukla. Overnight at Guesthouse. Day 21Departure! We will transport you to the airport. Thanks for trekking with Adventure Himalayan travels. We look forward to seeing you again! “The trek was definitely an amazing experience I will never forget!! Especially the view from Gokyo Ri was one of my highlights. In general I found the area around the Gokyo lake very beautiful! Also the Base Camp was nice to visit and the spirit there is quite impressive. Our Guide and porter were amazing! They were professional, knowledgeable and entertaining too. The lodges and food on this trekking were wonderful too, definitely exceeded my expectations. All in all the trek offers a lot of different landscapes and breathtaking views.Thank Adventure Himalayan Travels and Treks proved us good guide and porter”.